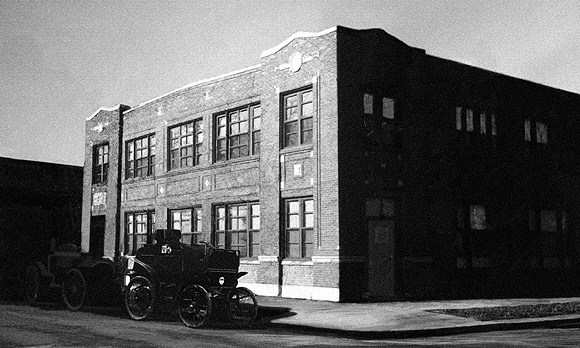 The building where Boilerplate was built. In Febuary 1888 Archie Campion, wealthy from royalties paid by Westinghouse Electric for his patents of valvular conduits and polyphase electric systems, had a laboratory constructed for a new project. It was fitted with equipment of Campion's own design, as well as devices created by Edward Fullerton (pioneer of fuel-cell technology), Frank Reade (aeronaut and creator of the Electric Man), and Nikolas Tesla (genius of electromagnetics). Below: Some of the equations used by Campion and Fullerton to create a new form of motive power for the mechanical man that was based on neither steam nor electricity! The mystery of Boilerplate's technical details continues to this day. "While Boilerplate was hopelessly primitive in its control mechanism, compared to even toy robots of today, it surpassed our best efforts in its success at providing a portable source of power. 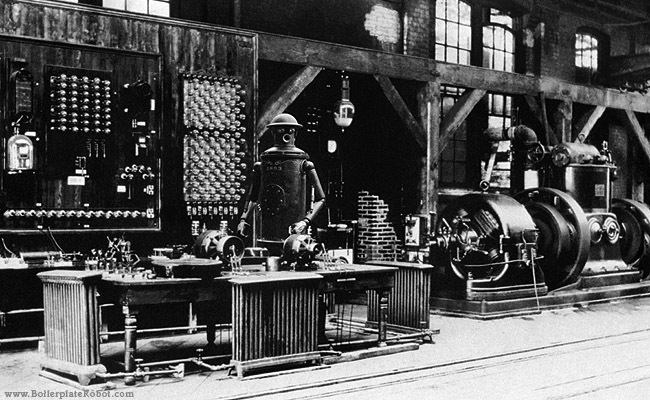 While the inventor described Boilerplates motive source as being "neither steam nor electric", it is apparent from photos of his lab notes that Boilerplate was actually powered by an early fuel cell technology. By "not electric", Campion meant that no dynamos were used to generate the electricity. Instead, Boilerplate's fuel cells produced power by oxidizing Iron to Iron Sulfate in a working medium of liquid Mercury catalyzed by dissolved Lead. This can be seen from the frequent references to (HgFeSO)2 and Pb in Campion's notes. The electricity from the fuel cell was directly applied to a single electric motor of Campion's own design, which drove either the arms or legs via a system of heavy duty clockwork and rods. While the fuel source of reduced iron and sulfur was readily available and reasonably inexpensive during the late 1800s, the system was hardly environmentally friendly - and it is no wonder that modern fuel cell research has come nowhere near to a similar solution. However, reproduction of Campions fuel cell should be considered for specialized environments. The ability of Boilerplate to continue operating in the frigid temperatures of Antartica deserves serious consideration for Mars exploration." 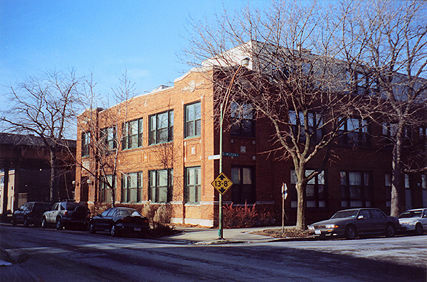 The laboratory seen in the above photograph was located at the northwest corner of Wrightwood and Wilton on Chicago's north side, one block east of the intersection of Lincoln and Ashland. Parked in front of the lab is a Columbia Electric Dos-a-Dos Mark VI; behind it is a Maxim Mark III. These automobiles and the elevated train tracks behind them date this picture to sometime between 1897 and 1899. The building still exists today. After Prof. Campion's death in 1938 the building remained vacant until 1942, when it was converted to produce spare parts for airplanes during World War II. After the war it housed a variety of small-scale manufacturing companies. In the 1990s it was gutted, refurbished, and given a third floor. It now contains upscale residential lofts.